Intonarumori machines were designed to recreate the industrials sounds of the early 20th century. Shaped like a box with a speaker on the front face, performers could generate sounds by manipulating levers, knobs, and buttons. Futurist composers created symphonies for the machines, although early performances were often met with disapproval and even fist fights. 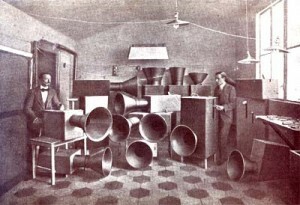 Since the Italian Futurist movement, many people have created their own Intonarumori machines, often with an open or translucent side so that the internal workings of the device are visible. Russolo built noise machines to recreate the sounds of the Industrial Revolution, so in honor of the 100 year anniversary of The Art of Noises, urbanSTEW built noise machines to recreate the sounds of our current Digital Revolution. The final installation is a set of six machines, one for each of the classified “noise-sounds” found in Russolo’s manifesto. By playing with simple buttons, cranks, and levers users can create and manipulate sounds that are a familiar to our current digital soundscape.